Introducing the 1st Personal Age-Fighting Machine using the same professional vacuum technology that costs thousands of dollars in exclusive salons - The NEW Crystalift Microderm System. Crystalift is not another cream, but a revolutionary counter-top machine offering a true at home alternative to spending thousands of $$$ on microdermabrasion, injections & laser treatments. 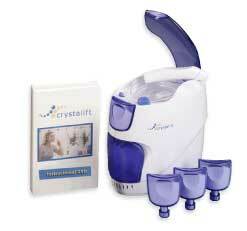 Dermatogists can pay $10,000 for the same technology...with Crystalift, you don't have to. Reveal radiant, healthy-looking skin in less than 10 minutes... GUARANTEED! CLICK HERE for our 30 DAY FREE Offer! Read more about how Crystalift's amazing new crystal microdermabrasion with vacuum-lift technology is revolutionizing the way people take care of their skin. Don't put it off another day. Order today to take advantage of our special introductory offer. Copyright © 20016 BioRenew Labs, LLC. All rights reserved.